LONDON (AP) — The battle between WikiLeaks founder Julian Assange and the American government was always going to be epic, involving concepts like free speech, journalists’ rights, national interests, even treason. Yet in a way, Assange has been fighting this battle for much of the past decade. The struggle has taken him through a “mansion arrest” in the English countryside; a dramatic escape into the Ecuadorian Embassy in London; a multimillion-pound U.K. police siege of the embassy that has strained government coffers; and even a bizarre attempt to turn him into a Moscow-based diplomat. Assange’s saga kicked off in November 2010, when his publication of 250,000 confidential U.S. diplomatic cables that month left American officialdom apoplectic. Joe Biden, then-U.S. vice president, compared Assange to a “high-tech terrorist.” Sarah Palin, the former Republican vice presidential candidate, called for him to be hunted down by U.S. troops like an al-Qaida operative. But in the U.S. intelligence community, the rage against Assange lingered. On the sidelines of a conference a few years ago, a former senior National Security Agency official told an Associated Press journalist that all he wanted was a couple of minutes alone with Assange in a dark alley, grasping his hands together as if he were crushing a man’s windpipe. It’s often forgotten that Assange once traveled easily to the United States, appearing at the National Press Club in Washington on April 2010 to present “Collateral Murder,” the title he chose for the camera footage that captured American helicopter pilots laughing as they fired at a crowd of civilians they mistook for Iraqi insurgents. Shortly after his visit, his source for the video — an American Army intelligence analyst now named Chelsea Manning — would be arrested after an ill-advised online confession. Assange dropped out of sight, likely aware that the government now had spools of conversations between him and Manning, including the one that now forms the centerpiece of the Justice Department’s newly unveiled indictment against Assange for conspiracy to hack into a U.S. government computer. For a while, Assange gravitated to the Frontline Club in London, the convivial journalists’ hangout where he dropped one media bombshell after another in collaboration with the Guardian newspaper and other media outlets. But staying in Britain, a close ally of the United States, was risky. In a fateful move, Assange decided to scope out Sweden, a country with powerful press protections and where he had already located some of WikiLeaks’ servers. The expedition would prove to be a disaster. With Sweden out of the question and “Cablegate” sure to enrage the Americans further, Assange looked to Moscow. A document published by the AP last year showed he considered the idea of getting a Russian visa through his friend and sometimes WikiLeaks collaborator, Israel Shamir. Assange was granted bail at the country mansion of Frontline’s founder, Vaughan Smith, receiving a stream of well-heeled and rebellious visitors in rural Norfolk while his London legal battle against extradition went all the way to Britain’s Supreme Court. 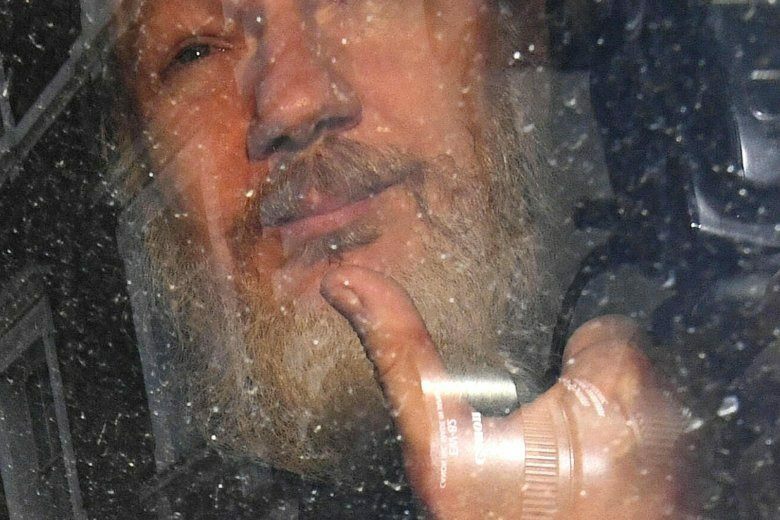 When that court finally turned him down, Assange dyed his hair, popped in colored contacts and skipped bail, fleeing to the Ecuadorian Embassy. From there, he carried on as before, albeit in a more constricted space. When the AP visited him in 2012, he occupied a back room in the embassy scattered with laptops, some marked “Do not connect to the internet.” When discussing an upcoming leak, Assange took a reporter into the corridor between his office and the bathroom, speaking in a whisper in a bid to baffle the high-tech surveillance thought to be deployed against him. But it didn’t stop Assange from publishing new material, notably in 2016, when his disclosure of U.S. Democratic Party documents stolen by Russian hackers hurt Hillary Clinton’s presidential election campaign. But if Assange had hoped for leniency from America’s new president, he would soon be disappointed. Twitter messages between WikiLeaks and Trump’s eldest son, Donald Jr., showed the group lobbying him to get his father to suggest that Australia appoint its native son Assange to be its ambassador to the U.S. Meanwhile, Assange wasn’t getting much more satisfaction from his Latin American host, which was increasingly embarrassed by its houseguest’s publications. The government of Ecuador tried all kinds of creative solutions to break the embassy impasse, including an abortive attempt to send Assange to Russia under diplomatic cover. When it became clear that the WikiLeaks founder wasn’t leaving — and that he wouldn’t curb his publications to suit Ecuador’s diplomatic interests — the government looked for a way to wash its hands of him. Tensions had been building for more than a year, but the Thursday morning raid in London was still a surprise. WikiLeaks had issued one of its periodic warnings that Assange was at risk, but at a Wednesday press conference, his longtime lieutenant, Kristinn Hrafnsson, told journalists that Assange’s eviction from the embassy had been averted. It’s not clear what comes next, but it will almost certainly be complicated. The interactions quoted in the U.S. indictment are nothing new — Assange’s instant message exchange with Manning has been in the public domain ever since the latter’s court-martial — so Assange’s high-powered legal team has had years to prepare their arguments. And Britain has generally tended to favor accused hackers fighting extradition to America. Lauri Love, a friend of Assange’s who was accused of penetrating U.S. government networks, was last year spared extradition after Britain’s high court ruled in his favor. British hacker Gary McKinnon, accused of breaking into U.S. military and space networks, won his fight against extradition in 2012 after a decade-long struggle. Assange’s fight may not take a decade, but he’s unlikely to see the inside of a U.S. courtroom anytime soon.